Top 5 Japanese Vegan Ingredients To Try This 2019! Managing those waistlines can be a massive challenge during the winter months, when we’re craving comfort food covered in cream. But by bringing Japanese food into your diet, you can eat delicious cuisine and stay trim simultaneously. The best bit? You can get it all at Japan Centre. Always find yourself trudging back from the shops with heavy bags of rice? Forget to buy rice in the first place? We’ve all been there, I’m sure. Well, worry no more – Japancentre.com has launched a new service aimed at taking the stress away from the monthly trip to the shops for U.K. mainland customers. The idea is to order a 6-month subscription to a bag of rice, and we’ll take care of the work and send you your rice at the same time every month! Plus, by participating, you’ll save on a whole bag of rice! Couldn’t be better, right? Wrong! We’ll throw in FREE SHIPPING as well which means that altogether, you are going to save more than £50! Please pay attention to the Terms and Conditions after the jump. New Service! Never Forget Your Rice Again! Always find yourself trudging back from the shops with heavy bags of rice? Forget to buy rice in the first place? We’ve all been there, I’m sure. Well, worry no more – Japancentre.com has launched a new service aimed at taking the stress away from the monthly trip to the shops for UK mainland customers. The idea is to order a 6-month subscription to a bag of rice, and we’ll take care of the work and send you your rice every month on the same day! Plus, by participating, you’ll save on a whole bag of rice! Couldn’t be better, right? Wrong – if you order now, we’ll throw in FREE SHIPPING as well! Have you ever heard of a tasty Japanese dish called omurice? Like many modern Japanese words which are a contraction of two English words, omurice is a combination of omelette and rice. 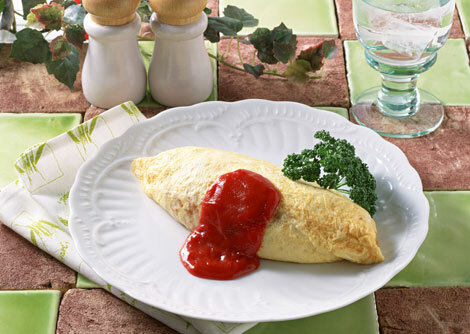 This comforting food is made with chicken flavoured fried rice wrapped up in an omelette and decorated with lashings of tomato ketchup. You often see this classic dish at western style family restaurants in Japan, but now you can make it at home with our easy to follow recipe.